If you have a little engineer in your family who has shown a bit of interest in electronics and coding, keep reading. 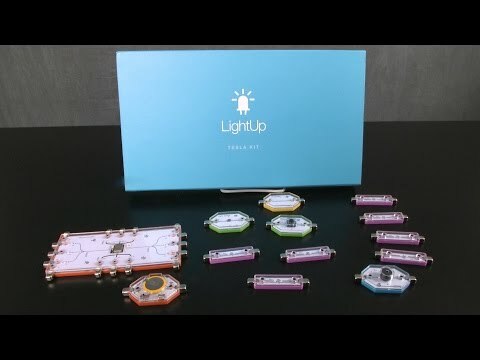 The Lightup Tesla Kit is a circuit building kit that gives your kids a head start in the world of electronics and coding, but in a safe environment. Instead of soldering complex circuit boards together, the circuit boards are magnetized and just snap together. Kisd can build neat things such as intruder alarms, musical devices, a remote control for a TV & other neat things. Learn important concepts related to electronics. Build basic projects to get started (using drag & drop programming block codes), and then move onto more complicated projects. Take a photo of the project you are working on and help you troubleshoot where it’s not working. Get a glimpse of how the “electricity” actually flows through the circuit boards. The LightUp Tesla Kit is the perfect activity to get kids interested in electric engineering and coding! Looking For Something Different Than The Lightup Tesla Kit? If so, visit our Educational section for more games and gadgets that are not only fun, but which teach your kids a thing or two.